Here are some deepsky astrophotographs taken with my LXD55 8" Schmidt-Cassegrain telescope. All of these were taken with a Scopetronix 25mm (80X) eyepiece using the Scopetronix Digi-T System using a Nikon Coolpix 995 with Remote Release Cable. 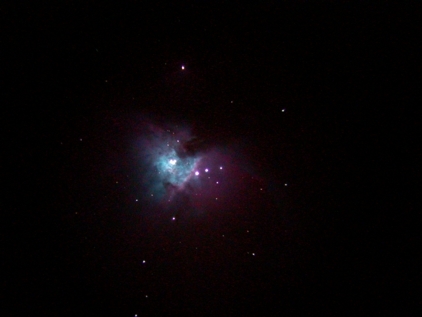 M42 at 14 seconds at ISO 800. No camera zoom and no image adjustments. M42 at 30 seconds at ISO 800. No camera zoom and no image adjustments. Go to back to my LXD55 Home Page.